at Eric's favorite deli rye. Eric, it's your recipe, wanna spill the beans? Susan has really done this recipe justice, and on the first try. It kills me that she can do this formula with better results than I have ever gotten. I guess that's the mark of a good baker, to be able to make minor adjustments that affect the outcome. Very nice Susan, a beautiful loaf! The recipe is a result of my research in Rye mixes a while back. I wanted to find a NY style Jewish Rye that didn't take 3 days to make that had personality. I've looked at and baked Levy, Greenstein, Mike Avery's Bohemian and a fellow named chef John V from Good cooking. I took all of this and simplified the process into something I could do in a long day and get reliable results every time. 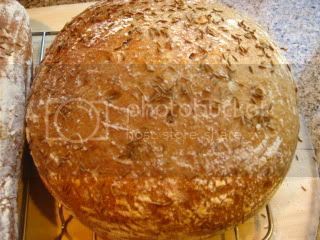 My family and I like deli style rye with caraway seeds and since we have many friends who are so inclined, I need to have a good loaf that works as house gifts and sandwich bread during the Jewish holidays and also for St Patrick's day corned beef. My German butcher friend has the best corned beef ever and serves 3000# plus every year at Irish fest in Milwaukee in sandwiches. 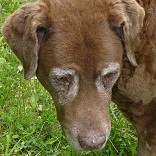 We have been playing with using my rye bread formula if I can find a way to do the volume. In the end I don't say this is the best rye bread you can make. If you like the sour rye that takes 3 days to build, this isn't going to satisfy you. If you want a great tasting rye that will make a great CB sandwich and you can do the process in a long day or overnight, give this a try. This is my formula for rye bread in the NY Deli style. The crust is soft after it cools and will slice better the next day. If you need bread that will stand a few days, this mix is good for mailing across the country. Sealed in a plastic bag after cooling, this rye will be great 4-5 days later and freezes very well. Mix, rest for 20-30 minutes, knead by machine or by hand for 8-10 minutes or stretch and fold several times. It is important to have well developed gluten. Do enough stretches to feel the gluten chains forming. Otherwise you may have trouble getting a good rise. Place dough in a lightly oiled bowl, cover and ferment till double, about 1 hour or so at warm (80 F) temp. Be sure you get double. Divide and shape into 2-2lb loaves, final proof for 45 minutes. Bake @370 for 30-40 Minutes. (I steam for the first 10 minutes)I’m looking for 190+ F internal temperature. When the bread comes out of the oven I brush with a glaze made from whisking 1T cornstarch into 1 Cup of boiling water and sprinkle with kosher salt lightly. NOTE:I have been re hydrating dry onions in all of the water for the dough, and using that water in the mix. If you want Onion Rye, use the onions also in the dough mix. It is wonderful! Measure the water in a microwave proof bowl and boil it. Add 1/4 Cup dry onions, mix around and let cool. Make the dough with this water. What hydration level is your rye starter, please? Lee, my rye starter is usually around 80 percent hydration. A better question is what was Susans?? The key is for it to be active and pumped up. Lee, my starter is 100% hydrated bread flour starter. Although, considering the yeast kicker, I don't know how much that matters. Hard to tell. Sorry cold oven start is your technique as I say easily confused. I was stuck in IE a few days ago and sure enough the stars were like beachballs. But not this time. Beautiful classic-looking rye, Susan. Just wants swiss cheese and mustard to finish it off. Beautiful loaf, Susan-the-poet! I haven't even been tempted to try rye, but after seeing your first attempt I might have to join the crowd. Well done, A.
yeah, yeah, the beans, the beans! I will start corning the beef now, soaking the mustard seeds, and check back for the recipe. Gorgeous loaf of rye bread, Susan! That loaf could not be more gorgeous! Lisa, the rye is steamed 2 at a time on a heavy sheet pan lined with parchment. I steam the oven for 10 minutes and bake at 370 F for 30-40 minutes. I usually brush the crust with prepared corn starch hot out of the oven and sprinkle with Kosher salt. The image at the top of this thread is from Susan from San Diego. The girl has the midas touch if you ask me. That's her first try and it's better looking than any of my attempts. That's the fun part of this hobby or passion. 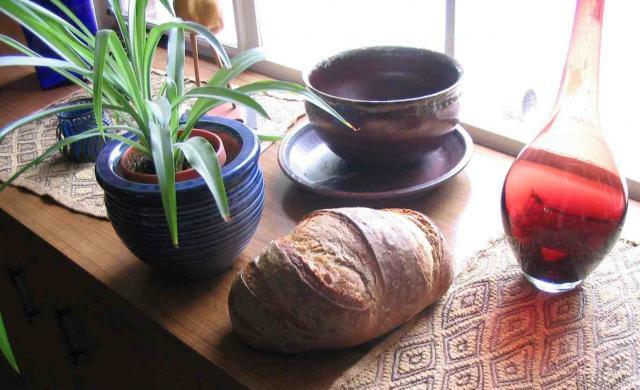 The outcome of the bread can be drastically changed by a few subtle changes in handling. I hope you try this bread. Let us know how you like it if you do. I made your recipe and it indeed makes an excellent jewish rye, as good as any recipe I've tried. I modified things a bit by using organic all purpose flour (slightly more then specified--you'll notice from the photo above the original formla is a way flat). I let the rye starter sour over 24h at room temperature, using 30g of storage starter to innoculate. I also proofed and fermented at room temperature, which took a couple hours then 45 minutes. Baked at 450 for 12 minutes, then down to 400 for another 20 or 30 till internal temp was 190. Delicious loaf, dude! Thanks for the comments, it is a reliable formula it seems that a lot of people have liked. I like your fermenting schedule and I suspect the results are a fuller flavor. You certainly got a nice oven spring! Interestingly, the German gentleman who has been my friend for many years smokes meat in a small commercial operation near here was the inspiration to put this together. The public store front is only open 3 days a week, otherwise he is busy smoking delicious meats for the Navy to ship all over the world. He and his wife have been telling all about the breads from the old country for years. So every now and then I gift a couple loaves of this to them. They seem to like it. Hmm, now I want a recipe for Montreal Smoked Meat. My husband made some, but while it is delicious, it is not Montreal Smoked Meat. Montreal Smoked Meat is awesome. My parents took me to Ben's 20 years ago and I still remember the taste. I see that Ben's closed in 2006. Sadness. Sad, but there are still several places. We go to Chenoy's in Beaconsfield, now, and there is another one just as good, but I can't remember the name. If anyone here lives in Toronto, you need to go north to HY7 and Centre Street. Centre Street Deli makes smoked meat to die for. If you go at lunch time you will have to wait in line for a few minutes, but they are up to Ben's or Dunn's standards. I'm not sure about the water absorption rate of clear vs AP flour. The first clear gives the dough a developed feel which I am comfortable with kneading/stretching as the gluten in the clear lines up. I haven't had any trouble with the dough pancaking during proofing which is how I know if I got the hydration correct. In general I like to use the highest hydration I can get away with and still bake free form. That's a very nice hand blown vase btw. The color is extraordinary! That is an amazing loaf!!! Makes me hungry~! In this case, the recipe is near the top of the thread. Just scroll up and you will find it. If you have a sourdough starter, just feed it with rye for a couple feedings. 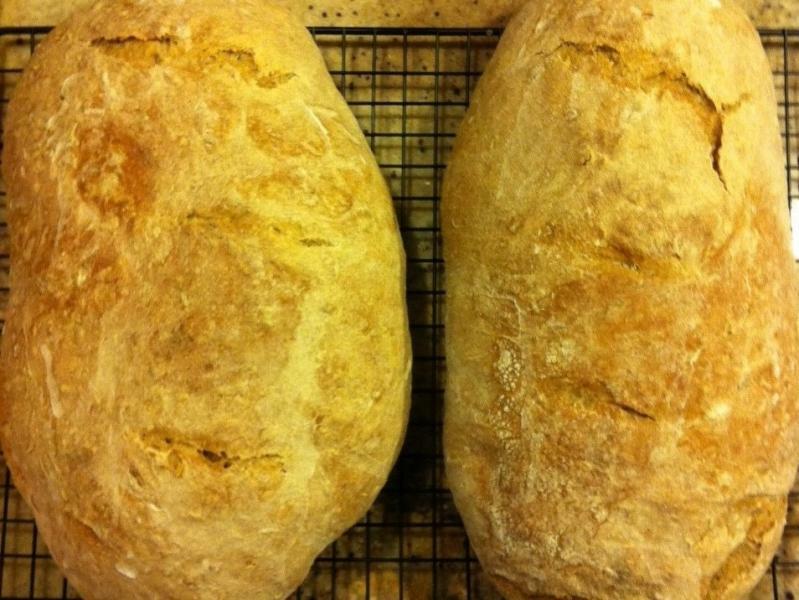 If not, make a batch of whole rye and water at 100% hydration and add 1/4 tsp of yeast and 2 T of vinegar. Let that sit at room temperature for 24 hours. That's a close approximation that will get you in the ball park. 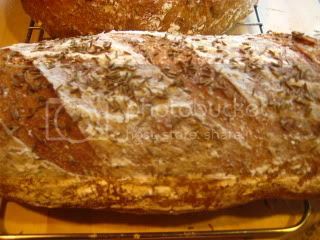 I just made this with bread flour and 1Tbsp vital wheat gluten and I must say its one of the best rye loafs I've had. I made the starter with hard rye, which is all I could get at our bulk barn...and we have no clear flour here. In my humble opinion it was comparable in taste to our jewish "open window bakery" rye, but not as pretty. I'm new and just learning, but I will definately be doing this one again. 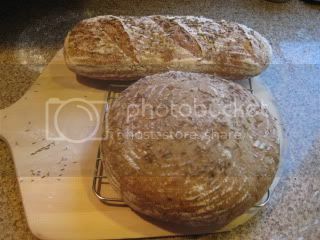 If they are round I can bake under my clay pot next time since that has helped with my regular loaves ..other any suggestions in order to keep the traditional rye torpedo shape? I made this a few nights ago, and WOW, what flavor! It was difficult to make, though, because the dough was so sticky. At first, I assumed that this was due to the rye flour. After reading through the comments, I'm starting to wonder if the problem was incorrect hydration. I followed the recipe closely, substituting KA AP for First Clear. I think I will try to make it again tonight, but will add more white flour until it is easier to manage. Im relatively new to breadbaking, and I live in Israel. Would you mind explaining to me what clear flour is? "...Professional bakers use the designations clear flour and patent flour for types of white flour (as opposed to whole-wheat flour, a category unto itself in which the entire wheat berry is preserved in the flour). They indicate what part of the wheat berry has been sifted through and packaged. Clear flour, which means the flour that clears the first sifting (to separate out the bran and germ), still retains some of the finer bran fiber from the outer endosperm of the wheat berry and is thus coarser and contains higher levels of ash. This flour is often used in rye breads and is usually made from very strong, high-protein wheat. Rarely is clear flour sold in regular markets, but it is a good value for professional bakers who can use it in whole-grain and high-fiber breads. Patent flour, sometimes called "second clear," is flour that has passed through a second sifting, thus retaining only the pure inner endosperm, or white interior, of the wheat berry. It is the purest grade and shows up in stores as bleached or unbleached all-purpose, pastry, bread, or high-gluten flour..."
You can buy 1st clear flour on the King Arthur site. I recently bought some and I think it was because of this recipe which I plan to make. This is also my favourite rye loaf..and I'm by no means an expert. What I do is rise it in an oval banneton then bake on a stone under an upended clay pot for 15 minutes at 450, then 370 for an additional 20 minutes. My loaf is a small 500 gram size. One thing I noticed..did you slash the loaf? Both of your breads look great! I have been using a higher oven temperature to bake this bread and I like the harder crust I get from it. I also leave the bread in the oven for 3-5 minutes after I shut the heat off with the door held open with a spatula to help dry out the crust. Otherwise the crust gets so soft it is hard to slice evenly when it cools down I find. What kind of rye flour are you using John? It looks like a light rye. You might try a whole grain or dark rye. It has a deeper flavor. This is still my Favorite Rye sandwich bread. Glad you are enjoying it. There is no 'first clear' flour available to me here in Canada. I make my small loaf with bread flour and I add 1/2 Tbsp of gluten flour. I wouldn't be to concerned with the gluten additive. 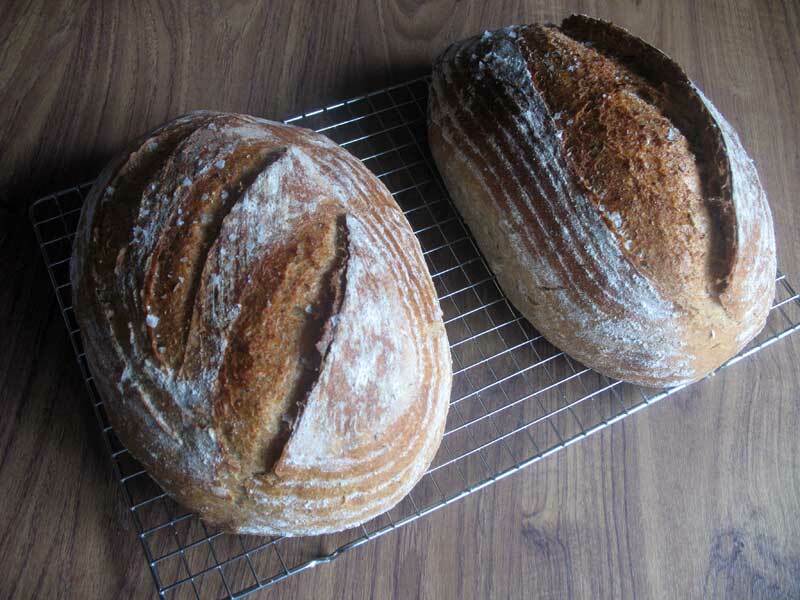 I frequently make this loaf with any kind of rye and plain bread flour. Just make sure you develop the gluten with kneading and a few stretch and folds. Keep the dough temp at the warm range and ferment until double and you will be fine. Thanks for the tip Eric ...I will try that next time. I'm not sure what's in the gluten flour..if it's not making any difference than I'd rather leave it out. Eric, your favorite rye for tomorrow's sandwiches! I thought this a good time to finally get around to trying your favorite rye recipe...I have all that cornbeef!! I'm not experienced making rye breads, but I absolutely love rye with caraway and so I just used what I had handy...KABF and dark rye and some wonderful fresh caraway...I should have made the smaller loaf a little darker roast...I wasn't sure what temperature and didn't handel the dough the way I wanted to...terribly actually but the practice was great and I will definately be making it again. I just cut the batch in half not weighing and one loaf was larger than the other and the larger one got a bit of a blowout...I should have let it proof longer..next time I would like more slashes too..they were kinda of fun. I will cut into them tomorrow..and hope! Thanks again, Eric! I have made David Snyder's multigrain breads about 3 tiimes with wonderful results (I will post some pictures) and thought I would change it up for hubby and try Eric's Fav Rye. I never reach for rye bread for a sandwich myself but I have to say this one came out delicious and since I have my daughter to finally help me with posting pictures, I hope to do just that. I refreshed my starter with 100% stoneground rye flour twice, and then didnt get a chance to proceed, so I refrigerated for 2 days. When I put the ingredients together yesterday, I had about 30g more starter and I threw it in. Then I forgot to add the extra yeast and sugar (I wish I had added the sugar because I like sweet). After mixing in the KA for a few minutes, gave 3 S&Fs and altogether bulk ferment for 7 hours. Shaped and proofed for 45m. Baked in 450F oven (the round loaf coverd) with steam for 10m, removed the cover and lowered the temp to 350F for 30m and and 3m with oven off. Cut the round loaf this morning (the long one went into the freezer) and it is yummy and passed the hubby test. My bread is very holey. Can anyone comment if this is because I had the extra starter? What would the extra yeast have done to this loaf? Oh Sylvia, That looks Wonderful! Your bread looks great Sylvia. It is a very forgiving recipe if you let it ferment and develop the gluten. I'm always so happy when this recipe turns out for other people, there are so many variables that can affect the outcome. Just what I was hopeing for, thanks, Eric! I am not the typical active "poster" (is there such a word?) on this site. Too many interests, too little time, but I DO appreciate a good loaf of bread. I make/bake all of our own bread. Just wanted to offer Kudos to Eric, for his wonderful recipe. 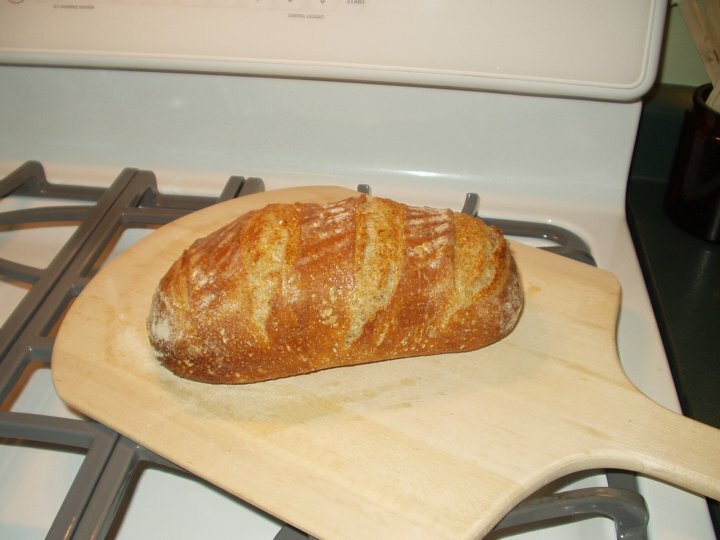 The best rye bread I have ever tried from an online source. ehanner, thanks, for offering a great recipe, accurate in its presentation and always worth making. I might add that we are NOT into sugar 'round here (pun?). I've just tried this recipe for the first time. I'm pleased with the result, but I did have some trouble with the glaze. Should I be soaking the (hot) crust by applying lots, or just enough to make the salt stick? Whatever I tried, it seemed to vaporize immediately, with no visible effect. Here is a picture of the crumb. When I do it again (I have half the dough still in the fridge), I will bake it a little longer so that the inside comes out less moist. The internal temp was only about 190 when I took this one out. I tried this recipe again this weekend. I am quite pleased with the results. Pictures are attached below. The crumb came out much better, I think. 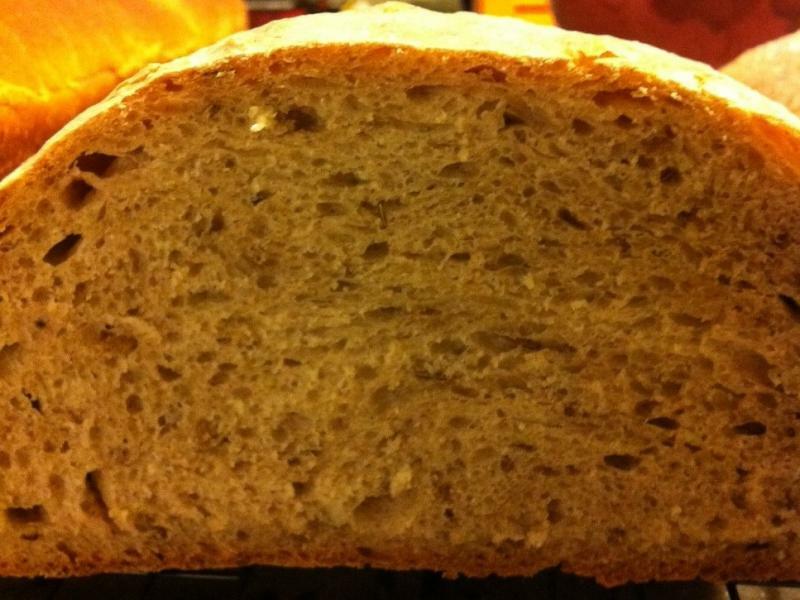 However, the crust is nothing like the nice golden crust in Susan's picture at the top of this thread. There are few things I can try that I list here, suggestions most welcome! I can start the baking at a higher temperature, I baked at 370 for the whole time, some of the other posters above started at 450 and then went down. I am using Safeway Organic AP flour. I don't have access to FirstClear flour, but I can try some kind of bread flour. Can someone please point me in the direction of how to make a rye starter. I would love to try this recipe. 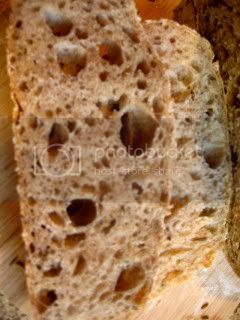 I would go the simple route..take a little of your regular discard and feed it rye flour instead of the normal bread flour. For this recipe I'd probably take about 10g discard and add 35 water and 55 rye flour. The recipe doesn't say what hydration the 100g rye starter should be - but a few grams up and down aren't going to make a big difference.